It’s no secret that I love the paperback era of the 1950s. Most of it is eminently entertaining, and almost always well written. Why? Because the writers in those days had been through the classic American schooling that drummed the structure of the English sentence into their heads. Then they paid their dues writing for newspapers, where grizzled editors would scream at them to write more clearly. The result was sharp and grammatical prose, unlike so much of what’s produced today, even in once respected newspapers. I recently saw the word anyways in an actual news column trying to make an actual point. I recently purchased The Noir Novel Megapack—four 1950s novels for only 55¢! 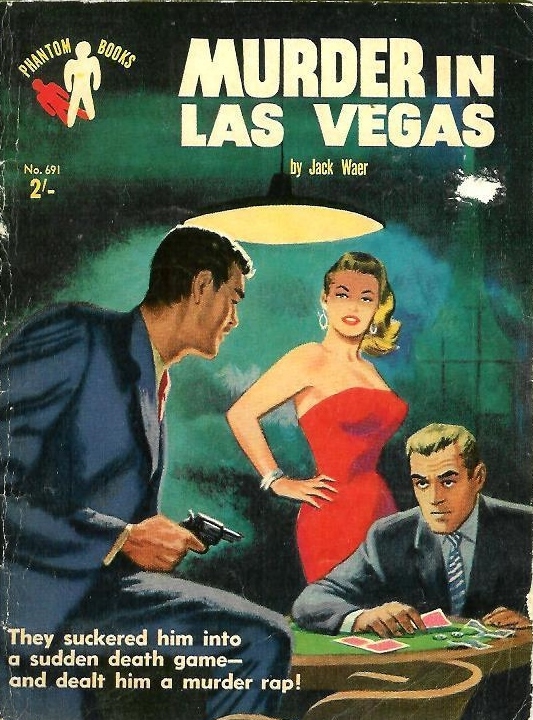 A few days ago I started reading one of them: Murder in Las Vegas by Jack Waer. It’s terrific. A solid noir set up: After a night of drinking and getting into a fight, a guy wakes up in his apartment, not knowing how he got there. He finds his .38 on the floor and picks it up. Then he spots a dead body on his bed just as his cleaning lady comes in and, seeing the gun in his hand and the body on the bed, screams and runs out. It isn’t long before he’s on the lam and hiding out in L.A.
His fist came up into my face and it was like having a stick of dynamite exploding inside my head. That was the end of the line. After that there was nothing but the black velvet road that led me through insane dreams. Slowly, I crossed around the bed. I went just so far, then stopped, although the thing inside my gut sprang forward, clawing and spitting. I wanted to yell, to scream out all the filthy things I’d ever learned in all those years on the way up. I wanted to yell until the noise drove away the sight in front of me. Somebody had been at her throat with a knife. I grabbed the threadbare huck towel off the rack and splashed some water on my face. After I’d dried off I took a look at myself in the mirror and decided never to do it again. The Vanguard was the address where the high tone and six-figure sports kept their private doxies in the manner to which their wives had never been accustomed. The place reminded me of my happy childhood. It was like Old Home Week to enter the dark interior and smell the sweetish odor of stale beer, dampness and despair. So I found myself wondering, who was Jack Waer? But my initial searches hit a cul-de-sac. On Amazon, there are only three titles listed for him, as used paperbacks. Murder in Las Vegas, Sweet and Low-Down and 17 and Black. Who was this guy? I didn’t find any biography of him on the usual noir sites. He was not listed in my go-to reference on this era, Paperback Confidential: Crime Writers of the Paperback Era. I even emailed an MWA Grand Master who is an expert in the pulps. He’d never heard of the guy. I began to formulate a theory. 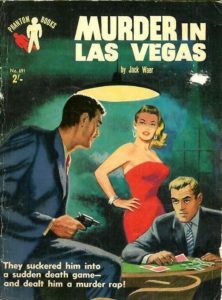 Because the writing in Murder in Las Vegas is so sharp and spot-on, I thought “Jack Waer” might be a pseudonym for a mainstream novelist. In those days, literary writers often went “slumming” in paperback originals in order to make some dough on the side, all while protecting their “good name.” Evan Hunter did that under the pseudonym Ed McBain. It was McBain who became rich and famous. I don’t know if Hunter ever forgave his alter ego for that. Did he die? Or did the literary author simply move on? It turns out I could not have been further off. So I went to the page, which turned out to be the blog of L.A. mystery writer J. H. Graham. Ms. Graham is, like me, third-generation Angeleno, and we both love the crime lore of the 50s. I am indebted to her for solving the Jack Waer mystery. Waer, who is also used the name Alexander John Warchiwker according to his naturalization forms, was born in Warsaw Poland in February 1896. He came to Los Angeles sometime after 1930, having previously lived in Detroit. In 1942 he listed Eddie Nealis as his employer on his WWII draft registration card; his job description was not specified. 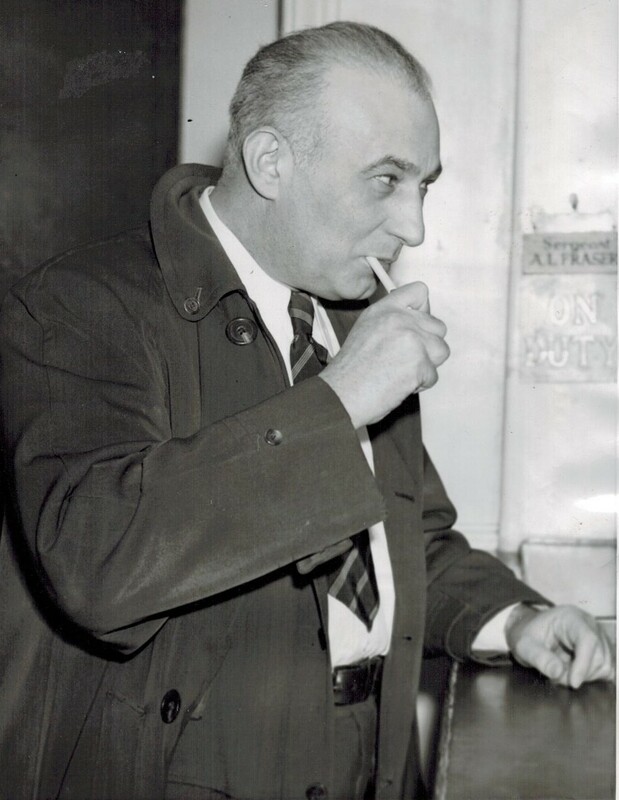 However, he was arrested on gambling charges in July 1943, when D.A. investigators raided an office in the Lissner Building at 524 S. Spring St. and found Waer running a dice game. The [Los Angeles] Times had called Waer a writer after the NYE 1945 hold-up. He may well have been one; In any case, he became a writer for sure by 1954 with publication of his novel 17 and Black (later issued in paperback as Sweet and Lowdown). So there you have it. A habitué of the illegal gambling dens of 1950s Los Angeles wrote a couple of books on the side, one of which is pretty doggone good! Even if your beat is the underbelly of society, it helps if you can write. Waer, according to Graham. died in Las Vegas in 1966. And if you are interested in crime fiction that takes place in Los Angeles back in those days, check out J. H. Graham’s mysteries. What obscure writers have you come across who should be better remembered?